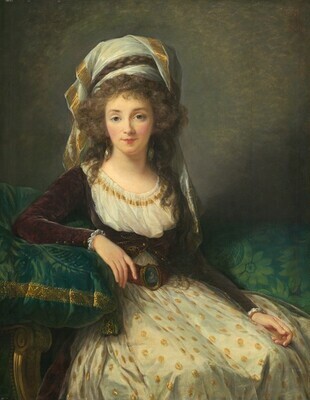 Politics played an important role in the career of Madame Vigée-Lebrun. A painter to Marie Antoinette since 1779, she was elected to the Royal Academy of Painting by the queen's decree in 1783. Her close ties to the royal family put her life in danger during the Revolution and she fled France in 1789, not to return until 1802. Therefore, it is not surprising that her portraits of society ladies reveal graceful poses, finished surfaces, and sweet, but controlled expressions, that both mask and betray the charged political climate surrounding her sitters. This young woman's elaborate costume displays three different foreign cultures. Her turban and jacket recall a Turkish harem outfit. The allusions to the exotic Orient signal an escape from the present as well as an Enlightenment acceptance of non-western ideas. Her flowing white gown recalls the costumes of ancient Greece and Rome, meant to inspire republican virtues. The prominent Wedgwood cameo at her sash is English; at this time British imports represented products of another political system, a parliamentary monarchy, that was considered as a potential model for France. In rigorously detailing the costume, Vigée-Lebrun shows how deeply contemporary politics had penetrated daily life. The subject's engaging expression conveys the nascent tensions of the period. upper right: Mde Le Brun / 1789. Presumably the collection of the sitter and her family; possibly (Ferol, Paris), c. 1850. Mrs. Stephen Lyne-Stephens [1813-1894, née Yolande-Marie-Louise Duvernay], Lynford Hall, Norfolk, Upper Grove House, Roehampton, and Paris; (her estate sale, Christie, Manson & Woods, London, 9-11 and 13-17 May 1895, 3rd day [May 11], no. 360, sold for 2,250 guineas); (Thos. Agnew and Sons, Ltd., London); sold 13 May 1895 to J. Pierpont Morgan I [1837-1913], London; consigned July 1943 by the Morgan estate to (M. Knoedler & Co., New York); sold October 1943 to (Wildenstein & Co., Inc., New York); purchased 3 January 1944 by the Samuel H. Kress Foundation, New York; gift 1946 to NGA. According to T. Humphry Ward and William Roberts, Pictures in the Collection of J. Pierpont Morgan at Prince's Gate & Dover House, London: Dutch & Flemish, French, Italian, Spanish, 2 vols., London, 1907: unpaginated. Frits Lugt, Répertoir des catalogues de ventes publiques intéressant l'art ou la curiosité, 4 vols., The Hague, 1939-1964: 2:nos. 22745 and 25136, records two sales in the 1850s for the dealer Férol, one of 22 January 1856, in which there were paintings, and the second on 7-8 December 1859, composed of prints and books. The NGA portrait was featured in neither. On the life and career of Mrs. Stephens Lyne-Stephens (earlier in her life, the French ballerina Pauline Duvernay), who was an art collector of considerable stature, see Louis Véron, Les mémoires d'un bourgeois de Paris, 6 vols., Paris, 1854; Charles Boigne, Ces demoiselles de l'opéra, Paris, 1887: 110-118; Lillian Moore, "Pauline Duvernay," The Dancing Times (January 1934): 449-452; Cyril W. Beaumont, Three French Dancers of the Nineteenth Century: Duvernay, Livry, and Beaugrand, London, 1935; Ivor Forbes Guest, The Romantic Ballet in Paris, Middletown, Connecticut, 1966. On p. 34 of the Saterlee Album (New York, Pierpont Morgan Library Archives), there is a photograph of the upstairs drawing room of J.P. Morgan's London home at Princes Gate (see J. Pierpont Morgan, Collector: European Decorative Arts from the Wadsworth Atheneum, exh. cat., Wadsworth Atheneum, Hartford, 1987: 32, fig. 7, 35, fig. 10). The painting is included in J.P. Morgan Jr.'s list of Morgan possessions lent to the Metropolitan Museum of Art in 1912 (document in the Morgan Library, box 168, folder 3, p. 143, no. 1347, as the "Portrait of the Marquise de Laborde by Vigée Le Brun...," with the Morgan inventory number 1341); Eliot W. Rowlands, personal communication with Joseph Baillio. Exhibition of Works by the Old Masters and by Deceased Masters of the British School. Winter Exhibition, Royal Academy of Arts, London, 1896, no. 53. Pictures by Painters of the French School, Corporation of London Art Gallery, 1898, no.80. Recent Additions to the Kress Collection, National Gallery of Art, Washington, D.C., 1946, no. 788. Roberts, William. Memorials of Christie's: A Record of Art Sales From 1766 to 1896. 2 vols. London, 1897: 2:250, repro. Pictures in the Collection of J. Pierpont Morgan, English School. London, privatedly printed, 1907:unpaginated. Helm, W. H. Vigée-Lebrun 1755-1842: Her Life, Works, and Friendships. London, 1915: 203, as Madame de Laborde. Cairns, Huntington, and John Walker, eds., Great Paintings from the National Gallery of Art. New York, 1952: 128, color repro. Einstein, Lewis. "Looking at French Eighteenth Century Pictures in Washington." Gazette des Beaux-Arts. 6th ser., vol. 67, no. 1048-1049 (May-June 1956): 244, repro. 248. Paintings and Sculpture from the Samuel H. Kress Collection. National Gallery of Art, Washington, 1959: 362, repro. Smith, David Loeffler. "Observations on a Few Celebrated Women Artists." American Artist (January 1962):52, repro. Walker, John. National Gallery of Art, Washington, D.C. New York, 1963 (reprinted 1964 in French, German, and Spanish): 317, repro. Summary Catalogue of European Paintings and Sculpture. National Gallery of Art, Washington, 1965: 136. European Paintings and Sculpture, Illustrations. National Gallery of Art, Washington, 1968: 124, repro. European Paintings: An Illustrated Summary Catalogue. National Gallery of Art, Washington, 1975: 366, repro. Eisler, Colin. Paintings from the Samuel H. Kress Collection: European Schools Excluding Italian. Oxford, 1977: 361-362, fig. 328. Baillio, Joseph. "Identification de quelques portraits d'anonymes de Vigée Le Brun au Etats-Unis". Gazette des Beaux-Arts 6th per., no 96 (November 1980): 158, repro. Walker, John. National Gallery of Art, Washington. Rev. ed. New York, 1984: 341, no. 464, color repro. European Paintings: An Illustrated Catalogue. National Gallery of Art, Washington, 1985: 424, repro. Ribeiro, Aileen. Fashion in the French Revolution. London, 1988:38-39, repro. National Gallery of Art, Washington. National Gallery of Art, Washington, 1992: 175, repro. Mittler, Gene A., and Rosalind Ragans. Understanding Art. New York, 1997: 186, fig. 12-11. Kirsh, Andrea, and Rustin S. Levenson. Seeing Through Paintings: Physical Examination in Art Historical Studies. Materials and Meaning in the Fine Arts 1. New Haven, 2000: 8, under fig. 2. The Arts of France from François Ier to Napoléon Ier. A Centennial Celebration of Wildenstein's Presence in New York. Exh. cat. Wildenstein & Co., Inc., New York, 2005: 61, fig. 70, 74 (not in the exhibition). Conisbee, Philip, et al. French Paintings of the Fifteenth through the Eighteenth Century. The Collections of the National Gallery of Art Systematic Catalogue. Washington, D.C., 2009: no. 94, 443-449, color repro.